The end of the school year has finally arrived, which means it’s time for grades and report cards. 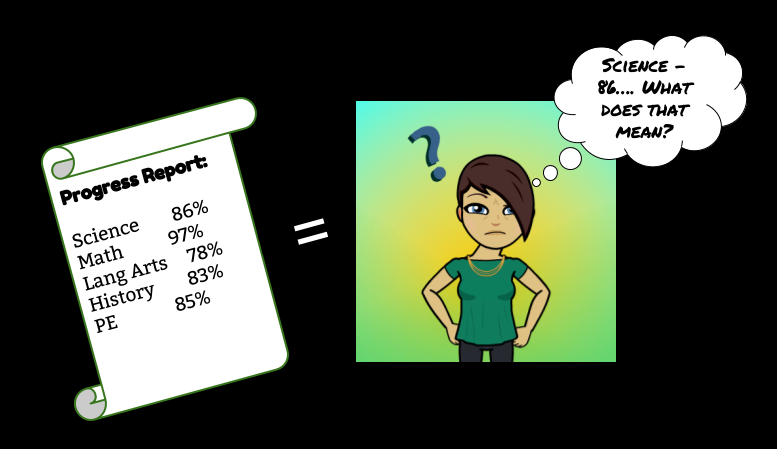 But as we mark exams and settle on final scores, there’s an important question that we need to ask ourselves as educators: when we send home a 10th grade student with a final grade of “86%” in Science, what exactly does that mean? Grades don’t tell us much. So, is there a better way to assess our students? I hate grades. I don’t think they’re meaningful and, even worse, I think they have a terrible effect on students. Why? They stop taking risks and play it safe. Check out the student comments we received about a grade-free assignment they were given. They stress over the grade and complain when they get 98% instead of 100%. Some of them will cheat to get a few extra points. They focus on the grade and lose their love of learning. The numbers tell them they’re not good enough. They develop a fixed mindset and stop trying. Some will cheat because they believe they can’t do it on their own. They become frightened of the grade and lose their love of learning. Do I think we’re at a point where we can get rid of grades? I know this will be an unpopular answer, but in my school, although we don’t give grades in elementary, I think we still currently need grades at the secondary level. Not only does the Dominican government require grades, but when our foreign students leave back to their respective countries, for the most part, grades are expected. And then there’s the issue of post-secondary education. Our students want to go to university and, for the time being, grades help them get there. Good grades earn them the scholarships many of them need. So within our educational system, I think we still have to give grades, whether we like them or not. Don’t grade homework. This is practice and shouldn’t count towards an assessment of a student’s overall understanding of the concepts covered. Instead, give specific feedback on homework so that students know how to improve. In writing, rough drafts and revisions shouldn’t be graded. In math, the mistakes made in homework shouldn’t count against a student’s grade. Give grades based on students’ mastery of learning targets. Grades shouldn’t be a mystery. Students should clearly know what they are expected to learn. Unpack learning targets together and make sure students know what they need to do to get there. Only use the mastery grade as the final grade. Don’t dilute it with practice grades, behavior, or participation. That 86% should clearly express how much of the science curriculum Milo mastered. Teach students to self-assess so they don’t think the teacher gives them a grade. Instead, students should learn that they earn a grade — by showing that they understand learning targets and work hard. Not only does self-assessment help them understand where grades come from, it puts them in the driver seat and helps them take charge of their own education. Allow time for learning. Not all students learn at the same rate, and the learning is the important thing, not the speed at which they learn. Some students will need extra help – meeting with the teacher before school, at lunch time or after school. Help students understand that they can learn, grow, and change. Make sure the grading system is part of a growth mindset environment and that students can see their own improvement. Having students collect work in a portfolio is a great way for them to see their growth over time. It’s also a way for students to measure themselves against the learning targets and self-assess. When students come up with their grades, the number becomes much more meaningful. Would I like to see a non-graded school? You bet! Unfortunately, I don’t think the setting I work in makes it possible yet. However, I think there are a lot of grey areas along the continuum from grades to no-grades, and we can move ourselves along towards the no-grades end of it. We can, and should, take steps towards a healthier grading policy. I also think every progress report should include a comment section, where we can let the world know that Milo is amazing — even if he doesn’t work for the grade. Thank you for writing this. I’m glad you did. It seems that there isn’t much of a difference between US schools and Dominican schools when it comes to defining arbitrary grades for students. I completely agree with all of your points. If we are going to assign grades, try to mak them mean something. Thanks for reading Aaron! I think the Dominican system is based a lot on the American system. The only difference is that we don’t have much standardized testing (only in 12th grade) which does make a difference in giving teachers more freedom in their teaching.